Amazon has just made a play in the mobile apps market with their own App Store. They are hoping to be the iTunes equivalent of Android apps. What is interesting is that Google has their own Android Marketplace that the current Android users are used to downloading apps from. 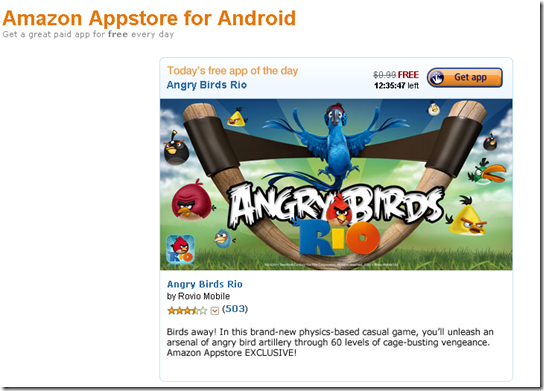 Amazon AppStore can be downloaded by Android phone owners starting today. The store is set to support hundreds of mobile operators and hardware makers. At launch time, Amazon AppStore has over 3800 Android Apps, Also, the store is to feature a daily deal section where they will be giving away paid app for free. Today’s free app is the uber-popular game Angry Birds Rio. With just a handful apps, Amazon is trying to make a difference by offering an unique feature called TestDrive. This will let you try out an app without paying for it for 30 minutes and then they have to buy it. Another way Amazon is going to drive traffic to their AppStore is by adding the mobile apps to their product recommendation engine. For eg. if you are looking up books on cooking, you will be shown recipe apps from App Store. Apple has sued Amazon over the use of ‘App Store’ trademark and will be interesting to see what pans out of this.